Colic • Asthma • Nursing difficulties • Growing pains • Poor sleep • Sports injuries • Ear infections • Back and neck pain • Headaches • Fussiness/Irritability • Constipation • Frequent colds • Scoliosis • Extremity pain such as Knee and Shoulder—These conditions may have many causes, I will thoroughly examine your child on the first visit to determine the source of your child’s problem. A chiropractor can help your child heal and attain true health. Chiropractors look beyond symptoms to address a problem’s root cause. When spinal or cranial joints don’t move properly (conditions called subluxations can arise) they can irritate the nervous system— the nervous system that runs your child’s body. This irritation may lead to problems in various body systems, depending on which nerve gets affected. For example, nursing difficulties, poor sleep and constipation can all result from nervous system irritation. Chiropractic care removes the source of irritation, allowing your child’s body to heal and operate properly. If your newborn is healthy, he or she should be examined at 2–3 weeks of age. That way, I can detect and eliminate any locked elements before they hinder the nervous system and create symptoms. This allows your baby to get an early start towards optimal health. If, however, your child has a specific problem, or even if you sense something is wrong, bring your baby in immediately. Newborns can be safely treated from the day they are born. First, come in when your child has a health problem. I will determine if the problem is related to a spinal or cranial joint that is not moving properly. Second, visit us when you’re interested in preventative care. The challenge of passing through the birth canal and the typical tumbles of childhood, as well as normal adaptations to growth can cause joints in your child’s spine or cranium to lock up. Children are so flexible that they are often unaware that anything is wrong. By releasing the joints that aren’t moving properly, I help your child maintain his or her natural state of health. Chiropractic care is new to many pediatricians, I am always happy to answer your pediatrician’s questions and provide the latest research. Chiropractors are doctors with a 4-year degree and over 4500 hours of study in subjects including anatomy, physiology, neurology, orthopedics, radiology and nutrition. In addition, I have taken advanced pediatrics courses. WHAT KINDS OF TREATMENT WILL THE CHIROPRACTOR USE ON MY CHILD? I use a combination of gentle spinal adjustments, and nutritional and lifestyle advice to maintain optimal health for your child. In addition, our office, is home to massage therapists, rehabilitation, exercise programs and orthotics evaluation, so these services are readily available whenever needed. It depends on the age of the child what type of adjusting is done. Infant and children up to 4 years of age, I prefer to use just the tips of my fingers to tap and/or activator for these small adjustments to the spine. This ensures that minimal force is introduced. Normally the child responds more to the noise from the activator than the adjustment itself. As children grow, adjusting changes based on what they respond to best. I prefer low force adjusting, mixing activator, Thompson Pierce drop and diversified moves together in order to provide successful realignment. MY CHILD SEEMS TO GO FROM ONE COLD TO THE NEXT. CAN A CHIROPRACTOR HELP MY CHILD STAY HEALTHY? A healthy immune system depends on many things— plenty of rest, good nutrition, proper hygiene and clear communication between the elements of our immune system. Our nervous system is an integral part of this communication system. HOW CAN A CHIROPRACTOR HELP MY CHILD SLEEP BETTER? Bones that aren’t moving properly can interfere with the sleep center in the brain and prevent a child from being able to reach a state of deep sleep. In addition, when children have trouble falling asleep or when they wake often, it may be because they have headaches, neck pain or other physical discomforts that keeps them in a shallow state of sleep. Either way, when I release the locked elements, your child is able to fall into a deep, peaceful slumber. These conditions may have many causes which is why I will thoroughly examine your child on the first visit to determine the source of your child’s problem. chiropractor to optimize their nervous systems and maximize their natural healing abilities. 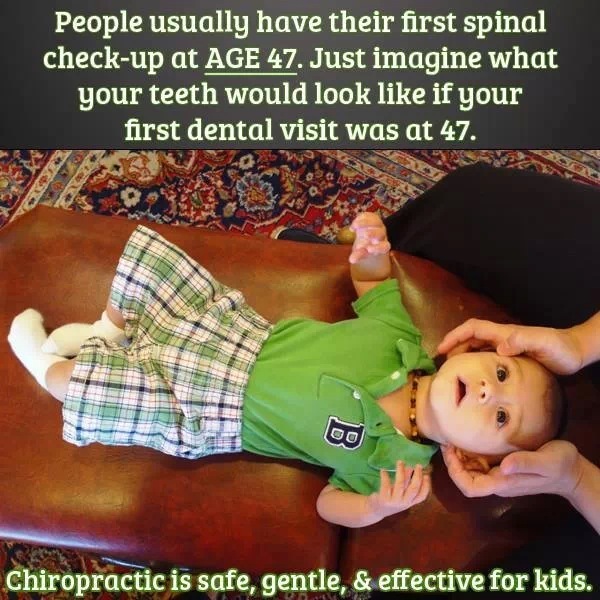 Children respond very quickly to chiropractic care— much more quickly than adults. A child’s health often returns after just a few treatments. Depending on your child’s specific condition, more or less care may be needed. I will examine your child on the first visit and let you know how much care to anticipate.